A couple of months ago Jessica was on vacation in Puerto Rico visiting her family and introducing them to her fiancé Jonathan. I was scheduled to meet them 1.5 hrs before sunset for their engagement session at La Concha Resort, but they got caught up in traffic, making our session one of the shortest ever. By the time they made it to the hotel, we only had about 35 minutes left of sunlight, and I was so worried about not meeting up to their expectations. Usually, it takes a little bit of time before we break the ice and clients are immersed in the session, and into each other. This was NOT the case with Jessica & Jonathan: from the first photo, they were already working it! 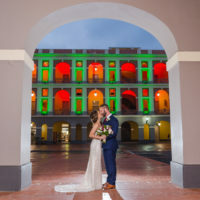 We did a short walk around the resort outdoor areas, then we moved into the Condado beach area, and we finished it off at Ventana al Mar, with an incredible, happy, romantic set of photos. Hope you enjoy them as much as I did when capturing them!